Whenever you spend an agenda counter, gain 1credit. trash or any agenda counter: Gain 2credit. "This is a one-of-a-kind opportunity…"
Poor Mark; this guy will be stuck with Titan Transnational: Investing In Your Future for the foreseeable future. And it's not like he's hard to poach: one influence means this guy returns all his emails. You want to know why Mark's stuck in such a rut? Try this with me: go up to the card art. Cover up his face so that all you can see is his hair and forehead. That looks like the hair of a man looking to the right, right? Now look at his face, and switch to covering his hair. Is he looking to the left? Clearly, Mark showed up to his first day as Internal Banking Mugwump... wearing someone else's hair. He'll never live that down! This card is almost inevitably part of Titan Transnational's ID. 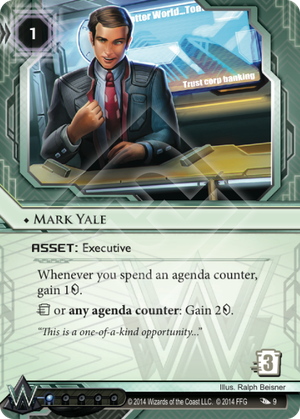 They might as well have printed that corp with the text "Include at least one copy of Mark Yale in this deck" because that's what everyone is going to do. It allows you to retroactively gain ridiculous amounts of money from agendas you scored, and can do so at Jackson Howard timing, which means it also wastes the Runner's time and resources. A fantastic card, with synergies all across Weyland's agenda suite. Even outside his home turf Titan Transnational, it's worth considering. Some Jinteki players might want this to give House of Knifes, Nisei, Labyrinthine or Genetic Resequencing more flexibility. It can be fun in HB psychographics too, allowing you to psycho a Vitrubius and pretty much triple your money from it.